Go back in time with Marty McFly (Michael J. Fox) and Dr. Emmett Brown (Christopher Lloyd) in the 1985 hit, Back To The Future. 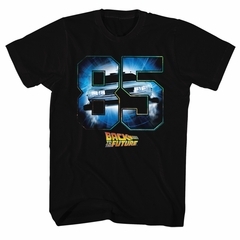 Let everyone know that you are a fan of the 1985 movie with this Back To The Future t-shirt!. Buy yours today!